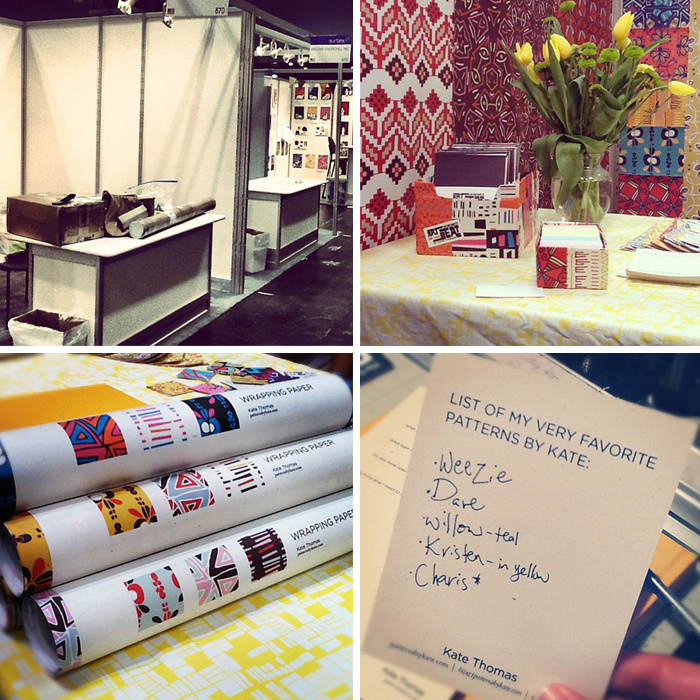 I have so much to say about my first show at Surtex. I can’t believe I did it. I am forever grateful to my mom for all of her help. I was so happy to have her there with me. I’m not sure how everything is going to go but when you see big announcements from me on facebook or twitter, it is probably because of meetings from Surtex. SO without further ado, here is my booth. Here is Mom and me in my booth! We picked up fresh yellow tulips. And that is my book sitting on the table. I also gave out my self promo Art of the Beat, along with my fab business cards letterpressed by my roommate. THEN I gave away MY wrapping paper. Yes, I made wrapping paper – three sheets of patterns. I had heard to get the work you want, you need to make the work you want. 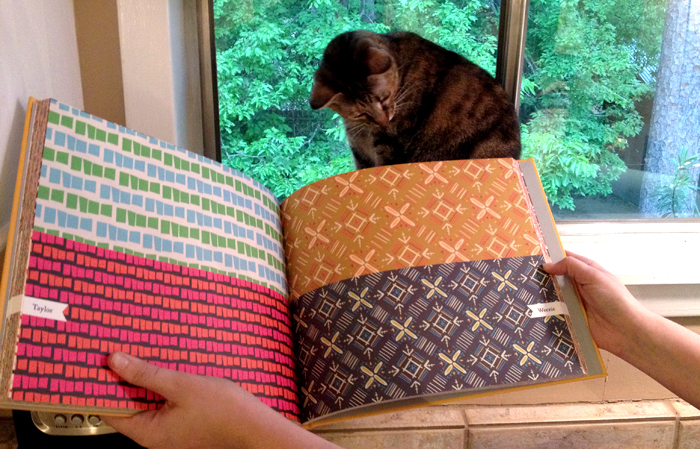 Below is a spread of my pattern book (that you see sitting on the table above). Weezie is staring at the Weezie pattern. I named every single one of my patterns after someone in my life. 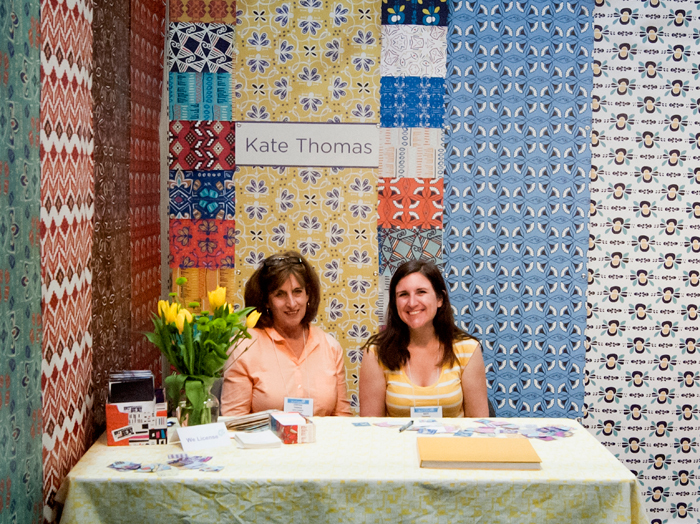 One thing that I did that I was most proud of was make “List of my very favorite patterns by Kate.” Manufacturers could write down the patterns they liked and then email me later if they were interested in me sending digital versions of them. AND it works! I am not gonna lie that I’m pretty proud of this idea. I’ve never seen anyone else doing this. Folks are sometimes tight lipped about their secrets about trade shows, but I thought I would share my tip. It was so easy to make and has proven to be SO useful. And I met one of my surface design heroes Helen Dardik. I’m a huge fan of her work. When I met her, I turned into a complete dork. But I am okay with that. I always turn into a nerd when it’s someone I love. She was so adorable and nice! 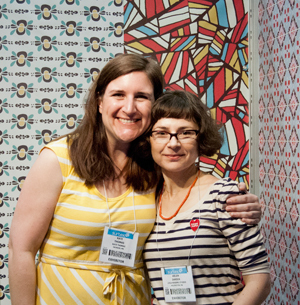 It was a surreal moment because I have been looking at photos from Surtex for years now, and here I am with Helen! I got to make friends with a lot of surface designers at Surtex. 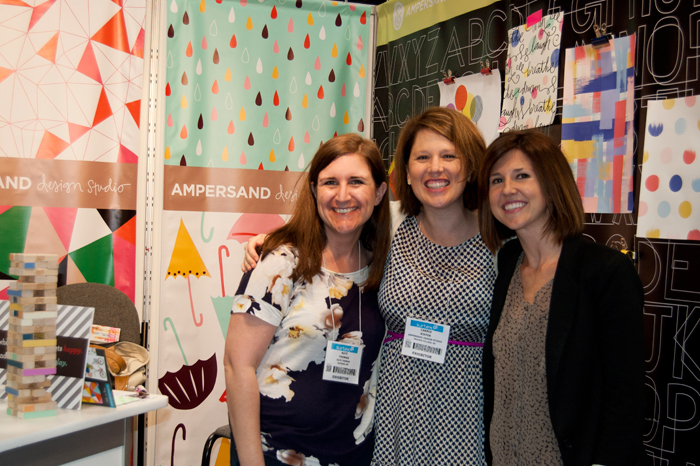 One of my very favorites was Morgan and Carrie of Ampersand Studio. They are a design duo powerhouse. I’m such a fan of them and their work. They had blogged about me a few months ago and it was just so fun to get to meet them. Here is a pic! (And yes, that’s Jenga on their table! so fab) And I think it was Morgan who called Surtex “Pattern Summer Camp.” It was their first year, too! But you sure couldn’t tell. They do great work. I didn’t get to snap photos but I also got to know the cutest husband wife duo of Sorry You’re Happy. And Wendy McKinney was across the “street” (across the aisle) from me, and I felt like I knew her all my life. She was soooo sweet to this little rookie. She was so encouraging and answered 1,000 questions to things that I hadn’t even thought about until I got there. It was so encouraging to continually be told it looked like I had been doing this for 10 years and not just 1. They were surprised how young I was coming out of school. One class from RISD came up and told me that they had been studying my progress on my booth in preparing for the show. I couldn’t help but laugh! There have been so many times I questioned if I should have majored in textile design and not graphic design, much less go to the #1 textile program in the world!!! And they were following me!?! I felt such pride from going to Mississippi State. I bragged so much about my friends and teachers from school, even though while I was there we didn’t even have hot water! The other thing I got asked by people is how I was able to afford to go. I would say I have a part-time job and then I would hand them Little Things Studio business card and say with such thankfulness that I travel to craft fairs, sell in retail stores and online and that has funded Surtex. 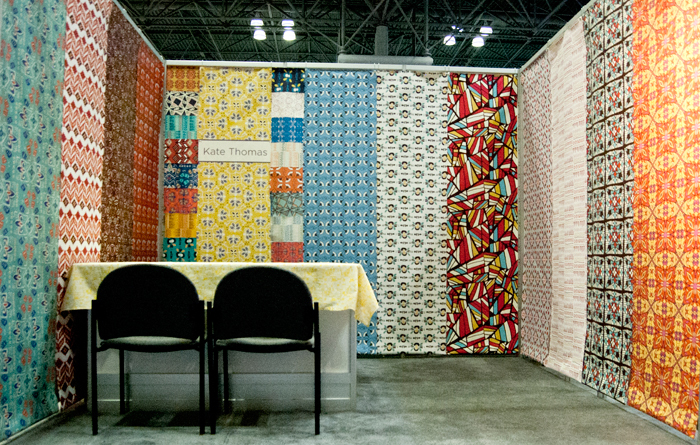 There was a woman a few rows over who had been working to come to Surtex for fifteen years! I am very blessed and very thankful. If you get cheesed out, don’t read this. But I have to say that I am so very thankful to every single person who has purchased a bookmark, journal, or print. Buying that “little thing” allowed me to hopefully further my career and pursue really big dreams. I am very grateful. Kate, I know we have never met in real life, but I am so impressed and inspired by you! You make me want to dream bigger and work harder. So excited to see what comes next for you! Congrats on your first show! Your booth looks amazing. Good luck with all the amazing things that will come next! Congrats Kate! You earned this and should be very proud of this profound personal achievement!! Way to DO IT! So many people are to scared to even try! Oh and how this is such a small world, my good college friend Megan Biram used to work with both Morgan and Carrie at Hallmark and I of course follow both of your blogs. Much love! Your booth looked AMAZING! Congrats again 🙂 It was fantastic to meet you, and I bet you’ll have awesome clients knocking down your door in no time! Keep up the amazing work!!! So proud of you roomie! The photos look great! The world is yours, Kate! Go get ’em!! So proud of you!! Kate, you were one of our favorite moments at the show! We were so thrilled to see you and so happy for your much deserved success! Loved meeting your mom too! I have been anxiously awaiting your report! Sounds like it was amazing. Hoping to buy Kate patterned stuff at major retailers soon!